Let’s Go Camping is a fun looking 48” x 60” kids quilt. The middle square in each block contains colored fishing lures with birch tree/blue sky fabric separating the blocks. Brown inner border with lots of camping terms on it make for fun learning to read time and the outer border has “Do Not Feed” the Bears signs with the cutest bears, trees and mountains. This is truly a camping quilt for a cabin, camper, or tent. 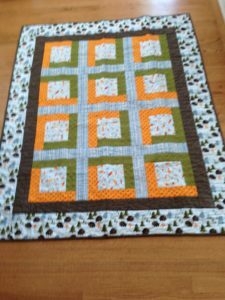 Easy to put together and easy to quilt with all straight lines. Kit includes pattern and binding at $47.95.